* Director, Rice Research and Development, Rice Research and Development Institute, Batalagoda, Ibbagamuwa 60500, Sri Lanka. Rice is the staple food of 18.6 million Sri Lankans and is the livelihood of more than 1.8 million farmers. More than 30 percent of the total labour force is directly or indirectly involved in the rice sector. The annual per capita consumption of rice was around 92 kg in 1998 and is dependent on the paddy production in the country and the price of imported wheat flour. In 1998 total production was 2.69 million mt of rough rice (paddy), which is about 96 percent of the national requirement. With the present population growth rate of 1.2 percent, slightly increasing per capita consumption, requirements for seed, and for wastage in handling, Sri Lanka needs about 3.1 million mt of paddy by the year 2005 (Annex 1). Hence, it is projected that the national average yield should increase to 4.1 t/ha to feed the population of Sri Lanka in 2005. In Sri Lanka, rice is grown under a wide range of physical environments such as different elevations, soils and hydrological regimes. There is a wide range of climatic and soil conditions in the country. The annual rainfall ranges from 600 mm in the arid areas to 6,000 mm in the very wet areas. Elevation ranges from mean sea level (MSL) to 2,575 m above MSL and the average temperature ranges from 30 °C at the MSL to 15 °C at the upper most elevations. Rice lands are distributed in almost all the above agro-ecological environments except for elevations above 1,200 m MSL. Hence, compared to many other rice growing countries, Sri Lanka grows rice under a wide range of environmental conditions. By combining the two parameters above (rainfall and elevation), seven major agro-ecological zones (AEZ) have been identified (LCDZ, LCIZ, LCWZ, MCIZ, MCWZ, UCIZ and UCWZ). These AEZ were further subdivided into 24 agro-ecological regions, considering the rainfall distribution, soil type and the landform. Rice is grown in all the agro-ecological regions except in WU1, WU2, WU3 and IU2. If water conditions are right, almost all kinds of soils could be used for rice cultivation. In Sri Lanka, the hydromorphic associates of almost all its great soil groups are used for rice cultivation (Panabokke, 1996). Figure 1. Percentage Distribution of Varietal Categories in Sri Lanka, 1958-1998. The distribution of rice lands in Sri Lanka reveals, to some extent, the diverse nature of the various inland valley systems. About 75 percent of the rice lands in Sri Lanka are located within inland valley systems of varying form and size and the balance of 25 percent are located in coastal plains and associated flood plains (Panabokke, 1996). The rice lands in Sri Lanka are further categorized either as irrigated (major and minor irrigation systems) or as rainfed and are cultivated in two distinct cultivation seasons. The major cultivation season (Maha) which is from late September to early March is fed with inter-monsoon rains and with the Northeast monsoon, which is well distributed in the Island. The minor cultivation season (Yala), which is from early April to early September, brings rain mostly to the Southwest region of Sri Lanka. Therefore, the extent under paddy cultivation in Yala is lower than that of Maha season (Table 1). National average yield of rice in Sri Lanka increased from around 2 t/ha in the 1970s to 3.5 t/ha by the early 1980s. Since then it remained stagnant despite 95 percent of the rice extent being brought under improved cultivars (Figure 1). However, yields higher than the national average were recorded in major irrigation systems where water supply is assured. In minor irrigation and rainfed systems, a lower grain yield was recorded due to various stresses and risk factors involved in crop management (Table 1). The present national average (3.7 t/ha) is around 50 percent of the genetic potential (6-7.5 t/ha) of improved cultivars recommended for cultivation in Sri Lanka (Table 2). Existence of a yield gap between the potential yield of cultivars and the productivity realized in farmers fields is evident in many developing countries. In the recent past, researchers have been successful in improving the genetic potential of new cultivars by introducing an improved plant type, but farmers failed to exploit this potential. The obvious reasons cited for this yield gap in many instances are crop management deficiencies resulting from socio-economic and/or institutional constraints. Expression of grain yield potential of a rice cultivar is determined by its interaction with climatic, edaphic and biotic components of the environment. The highest potential for rice productivity is in the Low Country Dry and Intermediate Zones where solar radiation and other climatic parameters are conducive and the edaphic environment is relatively favourable. Apart from relatively low solar radiation during Yala, lower yield potential in the Wet Zone is also due to excess water associated with various soil problems. A collaborative investigation undertaken by the Australian National University (ANU), Commonwealth Scientific and Industrial Research Organization (CSIRO) and the Department of Agriculture, Sri Lanka (DOASL) to quantify the yield gap and identify reasons, has revealed that the yield disparity between the farmer and researcher managed blocks were significant and can be narrowed down economically. The yield gap was due to compounded effects of many factors attributed to the farmers perception of production technologies. In many instances, the predominant factors were weeds, insect pests and inefficient management practices. (Dhanapala et al., 1984; Perera et al., 1990). In these studies, only the disparity between important management practices (stand establishment, weed control, fertilizer use, pest and diseases management) and seed quality were seriously considered. However, the contribution of some obvious edaphic and climatic factors determining yield was inadvertently neglected. Practices such as non-seasonal, untimely staggered cultivation, neglecting the optimum use of climatic parameters to increase productivity were not considered. These practices resulted in a build up of pest and disease pressure due to overlapping cropping cycles. Further, the factors influencing chemical, physical and biological properties of soil to improve and sustain fertility, the major determinant of crop productivity in the tropics, were totally ignored. Quality of land preparation, growth duration and appropriateness of the cultivar for a given ecology and pre- and post-harvest losses were considered less important. These shortfalls led to the neglect of vitally important climatic, edaphic, biotic and management yield determining parameters. A subsequent farm household survey conducted by Herath Banda et al. (1998) revealed that weed infestation was the most disastrous constraint to production across all agro-ecologies followed by either excess and/or deficit of water. The problem of weeds is severe in the Dry Zone and could be related to the availability of water as most farmers use standing water in controlling weeds. The estimated cost for controlling weeds in rice was over 20 US$ per ha (Herath Banda et al., 1998). Excess water problem is serious in the Wet Zone and in the other areas during crop establishment as more than 90 percent of the rice crop in Sri Lanka is direct seeded. Water deficit for rice cultivation in the Dry and Intermediate Zones could lead to substantial yield loss as in many instances the crop is subjected to terminal drought. Even though the pest and diseases were problematic for rice cultivation in the early 1970s, with the increase in the usage of improved varieties with required genetic resistance to many biotic stresses and improvement of farmer pest management practices, they are less important to farmers today. These household survey findings reflect the farmers attitude towards production constraints to achieve his target yield from his paddy plot with low yield potential. However, the real constraints to increase the yield potential of these production plots could be different. Obviously the major yield determinant is the inherent soil fertility, though given less attention in very many instances in these investigations. Wickramasinghe et al. (1995), found that not only the national rice grain yield is stagnating, but also the grain yields in research fields are gradually declining. 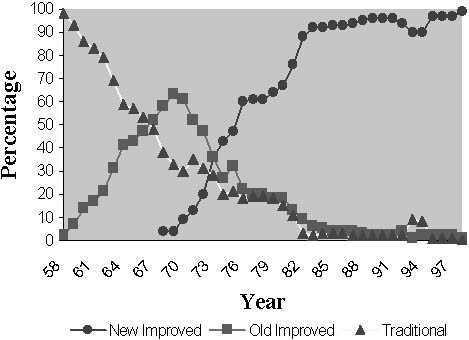 The grain yield of rice cultivars grown with high N fertilizer in long term N response studies showed a well defined declining trend over time. The yields of 7 t/ha or more achieved during the late 1970s with improved semi-dwarf rice cultivars in these experimental plots were never recorded. In long term studies (36 seasons) at RRDI, Batalagoda, Sri Lanka, without the use of any form of added fertilizer, but depending solely on the inherent soil fertility under maximum cropping intensity, yields around 2.5-3 t/ha were observed. This suggests that the inherent soil nutrient supply is sufficient only for a grain yield of about 2.5-3 t/ha in these fields. Studies have also shown that at RRDI, Batalagoda, to produce 5.5 t/ha of paddy, a direct seeded 4 month rice crop would absorb about 16 g N per m-2 while a transplanted crop would absorb about 12 g N per m-2. Further studies have revealed the existence of a non linear relationship between total leaf N at flowering and grain yield suggesting that the yield could be further increased with increased uptake of N but never beyond 6.5 t/ha. This suggests that not only N, but also other factors are responsible in limiting grain yield of rice. Some extensive soil analytical studies performed in Sri Lanka revealed that the micronutrient status of rice soils are at endangered levels. This is so specifically for Zn, Cu, Fe and S. Toxic levels are reported only for Fe and Mn in isolated instances (Deb et al., unpublished) where Fe toxicity is frequently reported in the Wet Zone of Sri Lanka. Studies on the response of the rice plant to added micronutrients also revealed that Zn and Cu are deficient in some areas. In plant analyses studies, Zn, Cu, S and Fe were reported deficient from previous investigations (Deb, unpublished). Therefore, it was understood that the reduced nutrient uptake at important growth stages of the rice crop due to reduction in soil nutrient supply was a major limitation to increased rice yields. Apart from the biotic and edaphic factors, climatic factors are also responsible for the yield gap. In the early days, farmers used to cultivate the rice crop with the onset of the monsoon. Timely cultivation and collective participation were primary considerations in rice culture. Togetherness and correct timing in planting and harvesting within the season, reduced the risk of terminal drought and pest and disease incidences. Cultivation of around 70 percent of the total extent of rice under irrigation does not necessarily imply the availability of an assured supply of water for rice cultivation. Many reservoirs (minor irrigation) are seasonal and are used for supplementary irrigation only. On many occasions the rice crop may be subjected to water stress during its growth cycle. Therefore, timely cultivation with the onset of the monsoon is essential to reduce risk of terminal drought. The practice of collective cultivation of the same growth duration rice cultivars is rare today. Further, early crop establishment helped the farmers to cultivate medium duration (4-4½ months) rice cultivars with higher grain yield potential where they exploited the growing environment to a maximum by harnessing the solar energy for a longer period. However, the use of medium duration cultivars is declining gradually and is less than 18 percent at present. There are complex socio-economic and institutional constraints hindering the productivity of rice. The escalating cost of production of rice along with the increasing cost of living affected the investment power of the farmer on inputs in rice cultivation. This along with the inherent poverty, small land holding sizes and unattractive land tenure system further aggravated the capacity to invest on inputs. Inferior quality inputs, difficulty in obtaining agricultural credit facilities and labour shortage also directly affected the output from rice farming. Breakdown of the agriculture extension system affecting the technology transfer process reduced the lateral transmission of information. Moreover, social status of the farmer in the open and competitive market has made rice cultivation unattractive, particularly to the younger generation. These socio-economic and institutional problems encountered by the farmer have an indirect effect on the rice production sector in Sri Lanka. Problems in marketing and lack of comparative advantage further aggravated the problem by discouraging farmers, thus widening the yield gap. The constraints for increasing productivity by bridging the yield gap are complex and can be categorized into 3 groups. They are: environmental, institutional, and socio-economic constraints. A comprehensive programme to overcome most of the above constraints to improve productivity and profitability was formulated by the DOASL in the mid 1990s. Bridging yield gap is the immediate output of the activities listed in this package. Simultaneously, reduction of cost of production, prevention of pre and post harvest losses and improvement of farm income by value addition etc., are also anticipated. Increase in total rice production could be achieved by increasing the cultivated land area and yield per unit area under rice. Production extent in the country cannot be increased any further, but the cropping intensity could be increased from the present 119 percent to about 130 percent so that the total annual cultivated extent would be 0.96 million ha. More of the neglected rainfed rice lands in the Low Country Wet Zone as well as those with supplementary irrigation facilities (minor irrigation systems) in the Dry and Intermediate Zones have to be given due priority in the rehabilitation process to improve cropping intensity as envisaged. In the comprehensive programme developed by the DOASL to improve productivity, a technical component addressing issues pertaining to genotype and environment interaction are discussed below. Emphasis is given to location specific cultivars to maximize the use of natural resources. Grain yield of rice could be increased by growing medium duration (4 month) cultivars rather than short duration cultivars. It is intended to increase the present extent under medium duration cultivars (4 month) wherever possible. However, when water is limiting, increasing the cultivated extent using short duration cultivars (3-3.5 month) with intensive management is recommended. Use of quality seed rice to maximize yield and to maintain quality of the harvest is encouraged. However, supply of seed rice to farmers at an affordable price at the correct time is increasingly difficult. Therefore self-seed rice production is encouraged while the farmer is supplied with mini-kits of seed with new cultivars for multiplication. Private sector participation in the seed industry is also encouraged by the government. Timely cultivation with the onset of monsoon rains is essential to economize on the use of inputs and to maximize the use of natural resources. Delayed planting especially in the Maha (October-March) season affects the growth and the age of the rice crop. Farmers are encouraged to follow a uniform cultivation calendar without any overlapping of different growth stages in a given tract. This would help to integrate crop management practices on a tract basis thus reducing time spent on maintaining individual crops. Further, it would make the job of extension and related supporting services easy as well as organizing marketing and other activities properly. Improvement of the soils physical, chemical and biological status for its sustainability is the key feature of this whole package of practices. At present, due to the increased cropping intensity and high temperature, the organic matter content in rice fields in the Dry and Intermediate Zones of Sri Lanka has been reduced to less than 1 percent. The use of improper implements for ploughing has led to the formation of a shallow plough layer or hardpan resulting in poor plant growth and grain yield. The topsoil is often coarse textured and therefore the addition of organic matter, especially rice straw and/or animal waste and ploughing occasionally to a depth of about 20-25 cm is considered advantageous in the majority of the rice lands. Macro and micronutrients, based on soil test values, are added at the correct time. Predominantly, stand establishment in rice in Sri Lanka is carried out by direct sowing. Transplanted rice in Sri Lanka is negligible as the labour cost is high. It is always recommended to transplant medium aged (4-4.5 months) rice while direct seeding short age (3-3.5 months) rice. This is also important to maximize the grain yield as well as to minimize the nutrient removal from the soil. Maintaining optimum plant density as recommended for different age classes of rice could further increase grain yield while saving the valuable soil nutrients. Weed management is a major problem in rice as water is limiting in most instances. It is recommended to practice integrated weed management by proper land preparation and by using manual, mechanical and chemical weed management practices. Use of correct herbicides at the appropriate stage of crop growth and application of the correct dosage is considered important to improve the effectiveness of the chemical. More emphasis is given to use safer insecticides at correct amounts to minimize pest damage. By implementing the IPM strategies it is intended to reduce the cost while reducing environmental pollution. Management of the major nutrients such as N, P and K with micronutrients where needed is another area with high priority in this package of practices. Nitrogen management of the growing rice crop is very important as return to all the other practices depends on proper N management of rice. Location specific target yield based fertilizer guidelines are available for all the age classes of rice for ready reference. Post harvest losses in rice in Sri Lanka are as high as 15 percent of the grain yield. It is intended to reduce this loss by proper time of harvesting, correct processing and storage. Value addition to rice is considered important in order to increase the income from rice farming in Sri Lanka. To maximize the profit and to sustain a conducive soil environment, integration of crops and livestock is encouraged wherever possible. To improve the status of the farmer, it is intended to develop farmer organizations which could function in organizing all the activities related to farming. In this regard, to avoid socio-economic and institutional constraints, a well defined role is played by an agricultural extension worker in organizing farmers for collective cultivation, timely supply of agricultural inputs, organizing credit and marketing facilities etc., so that no bottlenecks are anticipated in the production programme. With the adoption of the above package of practices it was clearly demonstrated that the average yield of many systems of rice cultivation could be increased (Table 3). *Average yield of a yaya (whole tract) cultivated using improved technological package of practices. On average, a yield increase of about 30 percent could be easily achieved with the adoption of the above package. It is therefore intended that the national average rice yield will also increase up to the expected targets. It is well established that with the existing technology, a grain yield of 8-10 tonnes of paddy per ha is possible in favourable well managed irrigated lowland rice lands in the Dry and Intermediate Zones of Sri Lanka. Even in the rainfed high risk environments in the Dry and Intermediate Zones, grain yield achieved using the improved technological package was comparable with the national average yield (Table 3). The Government of Sri Lanka has already launched a special rice productivity enhancement programme to implement the above technological package on tract basis in irrigated and rainfed rice lands, on continuously increasing extents as depicted below. In the initial year 5 percent of the extent in both irrigated and rainfed lands will be brought under this programme. From the second year onwards an additional 5 percent of the extent under irrigated lands and 2.5 percent of the extent under rainfed lands will be introduced in each season giving a time series extent to cover nearly 35 percent of the total cultivated extent of the land in both seasons (Table 4). It is anticipated that these technological package demonstration sites will act as dissemination centres where the technology will be laterally spread. With the successful adoption of this package it is expected that the average grain yield in the major, minor irrigation and rainfed systems will be increased to 5.66, 5.42 and 3.89 t/ha respectively. It is expected that, once this reasonably profitable package of practices is demonstrated, the cultivated extent will be increased as the marginal lands identified at present could easily be brought under cultivation. The anticipated cropping intensity will average around 130 percent, thus bringing the total annual cultivated extent during both seasons to about 0.95 million hectares (Table 3), which would ultimately increase the total rice production of the island. · Yield potential of a cultivar is only a hypothetical concept determined by a complex series of interactions with the components of the environment it is exposed to. · Disparity between the yield realized by the farmer and the potential of a cultivar in a given environment could purely be due to compounded effects of crop management deficiencies attributed to the inadequacies of knowledge and the poor management skills of the farmer. · Reasons for such a disparity may be technical, institutional or socio-economic. The yield gap thus observed could be bridged economically with a technological package of practices if institutional and socio-economic constraints are eliminated. · Productivity improvement by bridging the yield gap should be addressed in a broader sense to harness the maximum potential of the climatic, edaphic and biotic components of the environment. Some of these components can be modified but some are beyond the control of the farmer. · An appropriate technological package to express the potential of the cultivar in a given environment should be formulated and introduced to improve management skills of the farmer. · Organized rice farming through farmer organizations and a collective approach for cultivation, supply of inputs, organizing credits and marketing of the products is of paramount importance for the very survival of the rice farmer in Sri Lanka. Bandara, W.M.J. 1999. Assessment of the micronutrient requirement for the rice cultivation in Low Country Dry and Intermediate Zone of Sri Lanka. Proceedings of the symposium on micronutrient use in crop production, Sept. 03 1999. SLAAS, Colombo, Sri Lanka. Dhanapala, M.P., Perera B.M.K., Wetselaar R., Shand R.T. and Jayasuriya S.K. 1986. A qualitative assessment performance in Kurunegala and Anuradhapura districts, 1983/84. ANU Report Jan 86. Australian National University, Canberra. Herath Banda, R.M., Dhanapala M.P., de Silva G.C.A. and Hossain M. 1998. Constraints to Increasing Rice Production in Sri Lanka. Paper presented at the workshop on Prioritization of Rice Research, IRRI, Los Banõs, Laguna, Philippines, 20-22 April 1998. Panabokke, C.R.1996. Soils and Agro-ecological environments of Sri Lanka: Natural Resources series - 2, Natural Resources and Energy Authority of Sri Lanka. pp 140- 163. Perera, B.M.K., Dhanapala M.P., D.B. Wickramasinghe, Fasekas De St. Groth C. and Wetselaar R. 1990. Agronomic aspects of rice yield gap between farmer and researcher. Rice production in Sri Lanka. ACIAR technical report 17: 10-20.